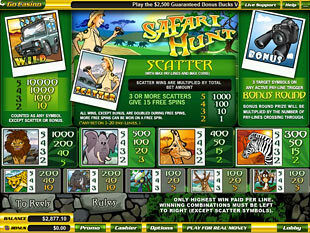 Safari Hunt Slots is a 5 reel 20 paylines video game released by Vegas Technology. Dive into the depth of wild jungles, enjoy the beauty of savanna and try to admire as more animals as possible. With the top jackpot of 10,000 coins that can be increased up to 20,000 coins during bonus feature, this game is really exciting to play. Such extra features as Free Spins with multiplier and bonus game provide you with more opportunities to win really impressive awards. 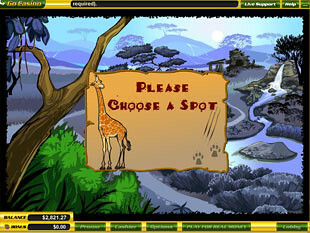 You can make this wonderful journey and watch your favourite animals even without installing special software on your computer. 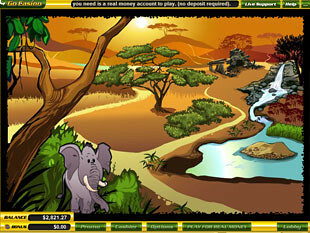 Just choose no download version of this game and enjoy this slot directly through the browser. What’s your best destination for holiday? It can be seaside, some ancient city or romantic Venice. But nothing compares to the African heat and its breathtaking nature with amazing animals. 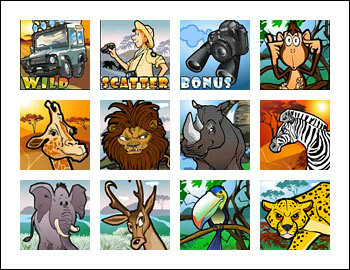 Enjoy the brightness of this game with such lighthearted heroes as Lion, Elephant, Giraffe, Zebra, Cheetah, Rhinoceros, Parrot, Deer, Monkey, Ranger and of course, such necessary things in your journey as Jeep, Camera and Binoculars. Hope they will make your adventure really absorbing. You can choose among such coin sizes as $0.01, $0.05, $0.1, $0.25, $0.5, $1, $5, $10.00. The minimum bet that allows you to play with maximum lines available is $0.20. The maximum bet that provides you with the opportunity to increase your chances to win the best prizes possible is $200. In other words, this penny slot can be appreciated by beginners as well as by high rollers depending on your style of game. The highest jackpot is 10,000 coins or $100,000 for 5 Jeeps. The second jackpot is 1,000 coins or $10,000 for 4 Jeeps or for 5 Lions. 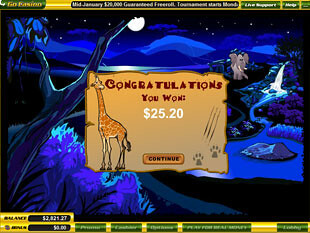 The third highest jackpot is 500 coins or $5,000 for 5 Elephants. Jeep is the wild symbol and perhaps, the most important thing for your amazing trip. The more jeeps you have, the more people you can take with you, the more exciting adventure you will have. And of course, let’s not forget that Jeep icon can substitute any other symbols except the scatter to produce more winning combinations for you. What is more, this splendid and cool car can present you the top award of this game that is 10,000 coins or $100,000. Seems to be really incredible, isn’t it? So, why not try and make such a fantastic journey to unknown African lands come true. Ranger is the scatter symbol. This light-hearted guy also is as risky as generous and can present you quite attractive prizes. Just get 2, 3, 4 or 5 Rangers scattered on the reels and multiply your total bet by 1, 10, 100 or 1,000 times accordingly. In other words, you can win up to $200,000 per spin if play with maximum $200 bet. Quite enough for your own journey. Free Spins. Getting three or more Rangers on the reels you activate 15 Free Spins. The best thing about this bonus feature is that all prizes are doubled during it. Thus, you can get up to 20,000 coins or $200,000 for 5 Jeeps this time. Just relax watching how much you winning during these magic spins. Free Spins can be retriggered. Bonus Game. What is safari hunt for? Enjoying animals? Getting three Camera and Binoculars on the payline you have all the necessary to watch various splendid animals. Your task is to choose among several locations to find the most interesting animals to enjoy and the most attractive prizes to win. You can select four times in total. However, in case you find the paw print, you will return to spins. 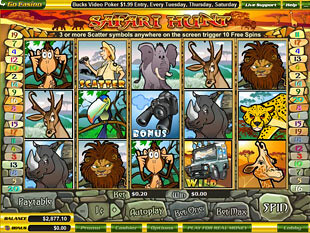 Safari Hunt slot machine is the game for all adventurous people who adore nature and want to win really astonishing prizes such as 20,000 coins or $200,000. Activate Free Spins or amazing bonus game to win more or just have a good time.